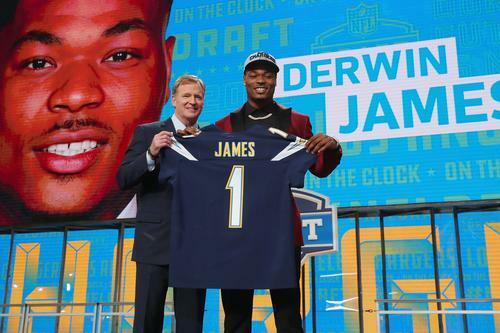 Last month a report surfaced that Los Angeles Chargers' first rounder Derwin James was targeted in a robbery while leaving a restaurant in Hollywood. The report surfaced well over a month after the incident took place during the rookie's first offseason with a boatload of cash. It appears Derwin's decision to flaunt his bonus-laden contract made him vulnerable to wizened criminals. The Chargers' rookie was accosted on his way to his Rolls-Royce while sporting a Rolex. Derwin has since confirmed the report as true. "I wouldn't wish that upon anybody," James said about the incident. "It happened. It was just one of those things that you never expect to happen to you, but it happened, and I'm just happy to be out here playing football." The Chargers' rookie signed signed a four-year, $12.4 million deal which includes a $7.1 million signing bonus which can be divided into divisible parts over the span of his contract. Though the team is refraining from expression condemnation over the incident, I wouldn't be surprised to hear Derwin receiving a tongue-lashing from vets in the locker room. Sometimes it's best to learn the lay of the land before you show up smelling of roses. By donning a fuzzy pimp look right from the onset, Derwin James signed his own bounty.